OMAX3 Ultra-Pure Omega3 developed by physicians affiliated with Yale University, omax3 Ultra Pure is tested twice for purityand is free of contaminants, such as unwanted omega-6 fatty acids, mercury,lead or PCBs, that can be found in fish supplements. omax3 Ultra-Pure is also gluten-free, and is optimally ballanced to support the body's normal inflammation response to achieve a balance of EPA and DHA. We all know not all Omega supplements are the same. With all the new supplements on the market how does one differentiate. To begin with some very important aspects to look for when searching for omega 3 supplements are purity and concentration. You want your supplement to be as pure as possible without the process used to obtain that purity affecting the supplement itself. With Omax3 you have no contaminants, like unwanted omega-6 fatty acids, mercury, lead or PCBs with can be found in some fish oil supplements on the market. I found the soft-gels easy to swallow, digest and not once did I have any fish-burp or aftertaste just as they say. After trying different Omega 3 supplements I can definitely give OMAX3 Ultra-Pure Omega3 a 2 thumbs up when it comes to purity and concentration. In fact I was highly impressed that one dose of Omax3 (2 soft gels) is equivalent to the benefits one receives from eating 8.5 egg yolks or even 90 walnuts. Who really would want to eat all that? Imagine all the calories consumed. I love eggs and eat them all week but I certainly don’t want to eat that many in one day and when it comes to walnuts that is my least favorite nut. I consume lots of sardines to help with my omega-3 consumption but I know for a fact I can’t eat enough sardines in one week to acquire the equivalent I receive from 2 Omax3 Ultra-Pure soft-gels. The fact is I need supplements to make up for the lack of omega-3 in my diet and Omax3 makes that easy and is one I highly recommend if you are looking to fill your own needs. OMAX3 Ultra-Pure Omega3 has been shown in clinical studies to help maintain healthy cholesterol levels and promote heart health. 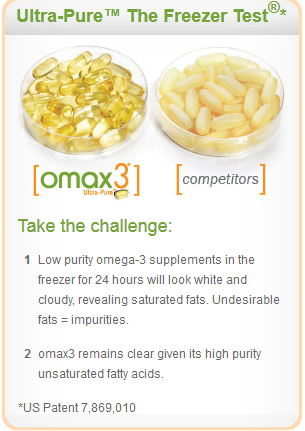 omax3 Ultra-Pure promotes proper inflammatory responses better than other omega-3 supplements. Make sure to leave comments separately. 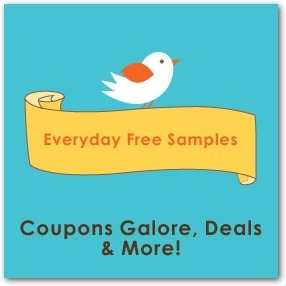 * "Like" Everyday Free Samples on Facebook. * Follow Everyday Free Samples on Twitter. FREE product/s pictured above were provided to me to facilitate this post. No monetary compensation was received. Giveaway ends Aug 24, 2012 at 11:59PM EST. Open to US residents. Winner/s will be picked via Random.org and announced the following day. Winner will also be pm'ed and will have 48 hours to reply before another winner is chosen. Opinions expressed in this content are my own and are not reviewed or edited by Omax3. Due to the new FTC rules, I was under no obligation to review any product if I so choose, Nor was I under any obligation to write a positive review or sponsor a product giveaway in return for the FREE product/s received.